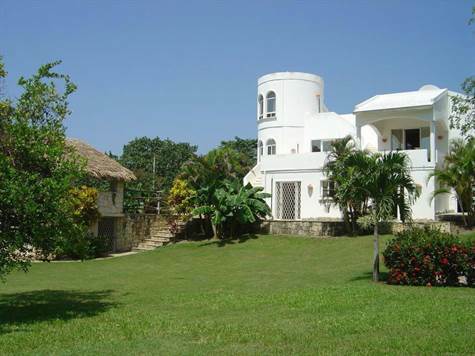 Turn key Mediterranean Style Bed and Breakfast located in Sosua, Puerto Plata. This is a great opportunity to move to the Caribbean and earn some income in the process. This well laid out villa consists of 6 bedrooms and 6.5 bathrooms. Each of the bedrooms is en-suite and have their own private access ensuring the owners privacy as well. The villa consists of 3 levels. The first floor comprises of 3 en suite bedrooms and a large studio also en-suite. The second floor (owners area) is a large 1 bedroom apartment with kitchen, dining, sitting area and a large balcony. Finally on the 3rd floor is 1 en-suite bedroom with its own roof terrace. All bedrooms come equipped with Air Conditioners. From the top floor of the villa an ocean view is available and is only a short 5 minute drive away. The main beach at Sosua is approx 10 minutes while the Puerto Plata international airport is only 20 minutes distance. The property sits on a 1,756m2 lot with a large pool and cabana area. The majority of the garden is laid with lawn with some fruit trees. Contact us now for more details on this amazing opportunity.